Panel 8 (center) of the controversial labor mural removed by Gov. LePage shows Francis Perkins, President Franklin Roosevelt's labor secretary and an untiring labor activist. Some Republicans claimed that a face in that panel bears a striking resemblance to former Department of Labor Commissioner Laura Fortman. In a 90-page opinion, U.S. District Judge John A. Woodcock Jr. granted motions for summary judgment in favor of LePage and members of his administration. The judge also dismissed two counts of an amended complaint filed by the plaintiffs. The decision essentially denied a trial of the lawsuit seeking to compel LePage to restore the mural to the walls of the Department of Labor building in Augusta. The judge said that because Maine owns the mural, it is free to do what it wants with the artwork. “The record establishes that the idea for the commissioning of the mural began with the state of Maine, that Maine established its theme, that Maine commissioned its creation, that Maine chose the artist, that Maine paid for the mural, that Maine owns the mural, that Maine displays (or not) the mural on its own property, and that Maine even has the right to destroy it,” Woodcock wrote. The judge said the state of Maine engaged in “government speech” when it commissioned and displayed the mural. 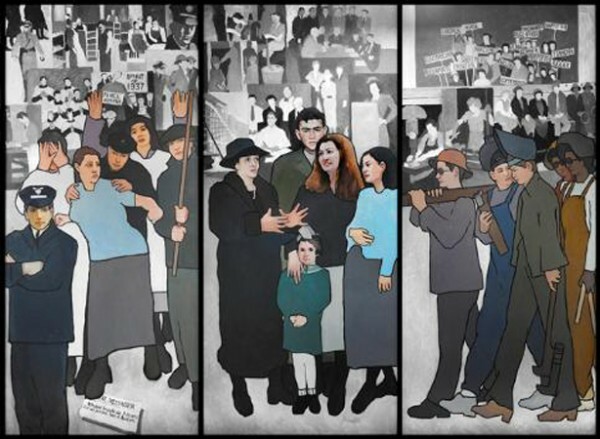 LePage’s decision to remove the mural, which contains 11 panels depicting the history of Maine’s labor movement, gained national attention, including a disapproving editorial in The New York Times and sendups by political comedians such as Jon Stewart and Stephen Colbert. LePage initially stated that the mural displayed a one-sided view of Maine’s labor history, but said later during an interview with NBC’s Brian Williams that his objection stemmed from where the money used to pay for the mural was obtained. Young added that the plaintiffs were still studying the opinion and would decide in the near future whether to appeal the ruling to the 1st Circuit Court of Appeals in Boston. “We’ve always believed that this was a frivolous, politically motivated lawsuit,” said LePage spokeswoman Adrienne Bennett. She said it would be “stunning” if government officials were barred from making decisions about what artwork can hang in public buildings. Bennett declined Friday to disclose the whereabouts of the mural, saying only that it is in storage and in a safe place. That place, however, is not the Maine State Museum, deputy director Sheila McDonald said Friday. Bennett said Friday that no plans have been made with regard to displaying the piece in the near future. “The [court] decision just came down today and we’ll be revisiting those questions in the coming days,” after the governor returns from his vacation in Jamaica, she said. Brooksville artist Robert Shetterly, one of three Maine artists named as plaintiffs in the lawsuit, expressed disappointment at Woodcock’s ruling. Shetterly, who travels to classrooms throughout Maine and across the country to speak about his “Americans Who Tell The Truth” series of portraits, said the ruling wasn’t a total surprise to him since Woodcock earlier had expressed reluctance to intervene in the matter. Shetterly said Woodcock had earlier suggested the “best remedy was the ballot” instead of a court ruling. Maine Attorney General William J. Schneider applauded Woodcock’s decision. Jason Savage, executive director of the West Enfield-based group Maine People Before Politics, also issued a statement supporting the ruling. BDN staffers William P. Davis and Dawn Gagnon contributed to this report.